The race to succeed European Central Bank Chief Economist Peter Praet is entering the home stretch with only one known contender, at least for now. Ahead of Wednesday’s close-of-business deadline for the Executive Board seat, Ireland’s central-bank Governor Philip Lane is the only declared candidate. While euro-area finance ministers have been tight-lipped about their level of support before knowing if there’d be a challenger, most governments have also signaled they won’t make competing bids. The biggest unknown remains Germany, which has yet to give its view. Lane would take over the monitoring of the 19-nation economy and the crafting of monetary-policy recommendations at a challenging time. With President Mario Draghi completing his eight-year term in October and Benoit Coeure leaving at the end of the year, the institution is about to go through a major revamp in leadership just as the outlook for the region clouds. Lane’s read of the economy is similar to Draghi’s. At last week’s Governing Council meeting, the Irishman argued the euro area faces a slowdown but isn’t headed for a recession, according to people familiar with the discussion, who asked not to be named because the session was private. A spokesperson for the Irish central bank declined to comment. That analysis was widely shared by his colleagues. Even though policy makers agreed risks to growth had moved to the downside, Draghi said there was unanimity about assessing the likelihood of a recession as being low. With a doctorate from Harvard and an academic career in international economics, Lane, 49, would follow a tradition established by his predecessors: Otmar Issing, Juergen Stark and Peter Praet all hold PhDs in economics. Irish Finance Minister Paschal Donohoe said last week that Lane is the “best qualified” for the job. Lane already expressed interest in joining the ECB’s board last year, when Ireland -- the only founding euro-area member to have never had a seat -- pitched for the vice presidency before the job went to Spain’s Luis de Guindos. The final list of contenders for Praet’s succession will narrow the field of candidates to replace Draghi -- Lane has been mentioned as standing a chance -- and may reveal Germany’s intentions. 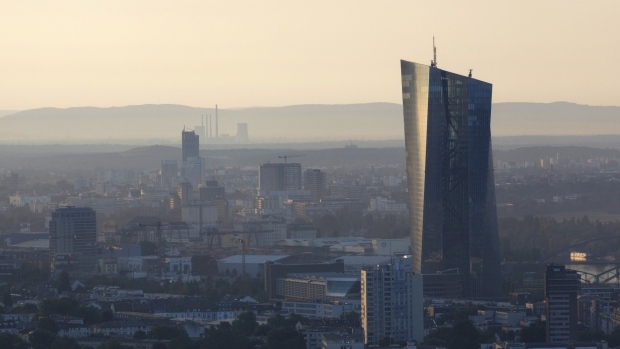 If Berlin decides to put forward an applicant at the 11th hour, it may signal that the government is no longer pursuing the ECB presidency and intends to reclaim a position it held since the foundation of the euro until it went to Belgium eight years ago. Chancellor Angela Merkel and her Finance Minister Olaf Scholz haven’t made a final decision, according to a person familiar with the situation. Finance ministers are expected to pick Praet’s successor on Feb. 11, and governments will make the final appointment after consultations with the European Parliament and the Governing Council. European lawmakers already issued a positive assessment of Lane last year. Spanish Economy Minister Nadia Calvino has said her country will support the Irishman, calling him an “adequate candidate.” Yet she pointed to a problem that continues to plague the Frankfurt-based institution -- the lack of women in executive positions. The last two jobs, the vice presidency and the head of supervision, went to men. --With assistance from Nikos Chrysoloras, Jeannette Neumann, Joao Lima, Helene Fouquet, Boris Groendahl, Birgit Jennen, Milda Seputyte, Ott Ummelas, Gordana Filipovic and Zoe Schneeweiss.